The first SRI trials in Senegal were done in 2003 at the initiative of Dr. William Settle (FAO) who reported control plots yields of 4 and 5 t/ha vs. SRI plot yields of 9 and 11 t/ha, respectively. In 2006, Peace Corps Volunteer Carrie Miner had some initial success introducing SRI to women farmers in the Kolda region (see New Farm article). During 2007-2009, Tim Krupnik and colleagues at FAO and the Africa Rice Center did a series of evaluations that included adapted SRI practices in the Senegal River Valley and in the Podor region. Their research during 2008-2009 showed that adapted SRI practices resulted in significantly higher yields than traditional farmer practices and were as good or better than current recommended management practices. However, while farmers appreciated the yield and water saving benefits of the adapted SRI approach, they were concerned by the increased labor requirements, especially for weeding activities that coincided with labor needs for the horticultural crop. These findings resulted in further experimentation with a hybrid system that incorporated elements of the recommended practice and the adapted SRI practices (maintaining intermittent irrigation, increasing crop density and following a single round of mechanical weeding with localized herbicide applications). The hybrid system was able to reduce weed biomass, labor, and input requirements (including herbicides) and gave the highest net profits in nearly all sites for the 2009 wet and dry seasons. During 2012, a delegation from Senegal at the Regional Workshop on the System of Rice Intensification (SRI) in Burkina Faso reported that trials evaluating SRI methods (comparing them with farmer practice under rainfed conditions) in the northeastern part of the country began in 2008 at four sites, and increased to six in 2011. 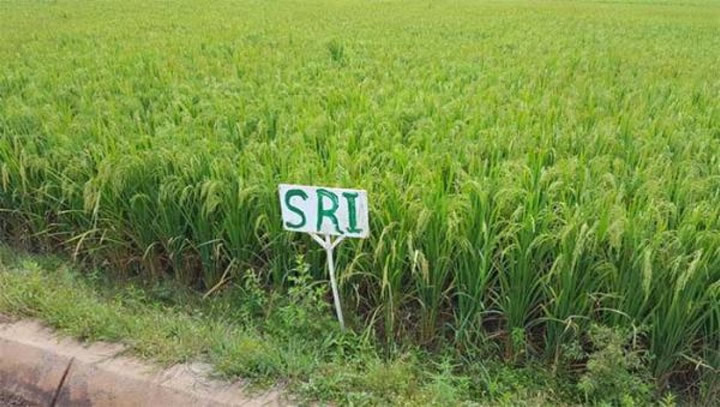 The trials, which were conducted under the Agricultural Development Project in Matam (PRODAM), reported that SRI yields averaged 53% higher than farmer-practice results. During June 2012, USAID's Expanded Agribusiness and Trade Promotion (E-ATP) sponsored a ToT on SRI in Kaolack, with 33 participants from seven partner organizations. In July, 2013, four Peace Corps-sponsored SRI trainings were provided in Senegal's Kaffrine and Fatick Regions. A study on SRI adaptations in these four sites was completed in 2014 by Lorraine Perricone-Dazzo as part of her Cornell University MPS degree (see update below). A regional workshop for finalizing the project "Improving and Scaling Up of the SRI in West Africa" was held in Saly, Senegal, from July 30 to August 2, 2013. The SRI-WAAPP project, a 13-country initiative, began during January 2014. The SRI-WAAPP project in Senegal, with Abdoulaye Sy as the Project National Facilitator, began during August 2014. The map at left (click to enlarge) shows the project target zone. As of 2016, there is an updated map of SRI-WAAPP sites in Senegal, which is located below. During 2014, SRI expanded in Senegal through of the efforts of the World bank-funded West Africa Agriculture Productivity Program (WAAPP) program, Peace Corps Senegal, and other smaller initiatives in the country. In December of that year, the National Agency for Agricultural and Rural Extension (ANCAR), in conjunction with SRI-WAAPP made plans to mobilize 5,000 rice producers in Senegal's Fatick and Kaolack regions to try out SRI methods in order to improve rice productivity and farmer income. A four-day technical training was held in Dakar from August 3-6, 2015, with participants from 11 ECOWAS countries, who learned from SRI-Rice how to use ESRI's data collection, visualization and reporting platform to manage information on SRI progress for the SRI-WAAPP Project. While the SRI-WAAPP project ended at the end of 2016 (see map for field sites), subsequent visits from World Bank and WAAPP officials in October 2017 confirmed continued appreciation of SRI by farmers, who were spending less on seeds and inputs, while helping to mitigate climate change by lowering greenhouse gas emissions, and reaping bigger harvests. [December 22, 2017] An SRI initiative undertaken during the past two years has begun to show results in promoting rice self-sufficiency along with a reduction in Senegal's annual import bill for rice. The project leaders believe that during this next year SRI will gain yet more ground and will be rolled out throughout the country by the majority of Senegalese producers. On December 21, a workshop to review SRI dissemination was held by National Agricultural and Rural Advisory Agency (ANCAR) and the Agricultural Productivity Program in West Africa (WAAPP), who are partners in the SRI project. SRI has led to marked improvement in rice production in the communes, lowlands and valleys where the Agricultural and Rural Council (CAR) programs are carried out. Yields, which have risen 50% to 100%, vary between 3 to 5 t / ha throughout the 10,000 ha planted. Nevertheless, much remains to be done to achieve the objectives for rice production set by the National Rice Self-Sufficiency Program (PNAR). In addition to reporting on SRI diffusion, the workshop participants discussed SRI's role in resisting the threat of the climatic changes. [October 29, 2017] At the 10th joint World Bank / State of Senegal support mission to the implementation of the West Africa Agricultural Productivity Program (WAAPP), Ayfa Fatimata Ndoye Niane, senior economist at the World Bank office in Dakar, noted the integrating dimension of the West Africa Agricultural Productivity Program (WAAPP), particularly through technology transfer from Mali, Niger, Burkina Faso and Ghana to Senegal. Participants of a delegation tour to Dialacounda (Kaolack), Coular Socé and Niombato (Fatick) learned that women SRI-adopters supervised by the National Agency for Agricultural and Rural Council have experienced yields up to four times higher. "SRI has been tested at the National Specialized Rice Center in Mali, which has collaborated with WAAPP to introduce this innovation; SRI has been much appreciated by the producers who have adopted it," said Ms Niane, who welcomed the regional dimension of the project. [See French language APS article for details.] An article on the WAAPP website adds that, in the fertile Senegal River valley, farmers who have been in SRI techniques, are using compost, applying organic instead of mineral fertilizer, and planting 20 instead of 60 kilograms of rice seed per hectare. While spending less on seeds and inputs, they are helping to mitigate climate change by lowering greenhouse gas emissions, and reaping bigger harvests. [May 2016] The project on Improving and Scaling up the System of Rice Intensification (SRI) in West Africa (SRI-WAAPP) has had continued success promoting the introduction, adaptation and scaling up of SRI in Senegal since January 2014. SRI continues to expand in the areas of Senegal where rice is cultivated, as can be seen in the SRI-WAAPP Senegal site map to the right. The map, which is current as of 2016, shows 90 sites where farmers have received training in SRI since the project formally began in 2014. A December 2015 trip report discusses the regional workshop and visits with CORAF in Dakar. All 13 countries attended the regional workshop and provided deadlines for finishing their baseline surveys. [February 2015] Following a regional planning workshop and national training in Côte d'Ivoire in mid-February, SRI-Rice Technical Specialist Devon Jenkins spent late February and early March conducting a support trip in Senegal for the SRI-WAAPP project. During the trip he and the project's National Facilitator, Abdoulaye Sy, and WAAPP Senegal's Agricultural Specialist, Mour Guèye, conducted SRI trainings in Ziguinchor and Toubacouta. They also visited organizations including PRODAM, Peace Corps, and IED Afrique, which are also active in promoting SRI in Dakar, Matam and Ziguinchor. [January 8, 2015] Senegal’s national television reported on a workshop and training in Kaolack in central Senegal. The SRI segment of the news program, which airs at 20:57 to 23:45, also includes information on the SRI-WAAPP project's activities in Kaolack, Fatick and Kaffrine. Abdoulaye Sy, the National Facilitator for the project, relayed that since SRI has been proven effective in the region, and, with 150 million CFA of financing approved for three years from le Fonds National de Recherches Agricoles et Agroalimentaires (FNRAA), Senegal is ready to take SRI to scale in the country’s Peanut Basin. Dr. Waly Diouf, the coordinator for the national program for rice self-sufficiency (Program National de l’Autosuffisance en Riz), also noted that SRI is very relevant and these methods should be taken to scale throughout Senegal. (See minutes 20:57 to 23:45 of the TV clip to view the SRI segment.). [December 1, 2014] According to an article on the Senegal News website, the National Agency for Agricultural and Rural Extension (ANCAR) plans to mobilize 5,000 rice producers in Senegal's Fatick and Kaolack regions to try out SRI methods in order to improve rice productivity and farmer income. According to Abdoulaye Sy, ANCAR's director responsible for the Peanut Basin area and the WAAPP National Facilitator for Senegal, the spread of SRI will be accomplished by training technicians and NGOs, who will then train farmers in the regions. During a recent workshop to launch the SRI activities, Sy noted that producers who are trained in SRI will pass on their knowledge to other producers the following year. He said the "cascade training" should reach about 5,000 rice producers in the Fatick and Kaolack within two or three years. A second article on Kaolackois.com notes that the WAAPP project will also promote SRI in the Kaffrine region. [July 2014] Lorraine Perricone-Dazzo (right) has completed a project for her MPS degree in which the potential of locally adapted methods of SRI to raise yields was assessed in four target villages in Kaffrine, Senegal. This study, which she carried out as a Peace Corps volunteer in conjunction with her graduate work at Cornell University, shows that a combination of local practices and best management practices (BMPs) inspired by SRI can raise yields to above household consumption needs without increasing labor requirements. Surveys, trainings, and experimentation during 2012-2013 showed that the most successful combination of practices for both yield and labor savings in the area were in-line direct seeding using local animal traction machinery shown at left (achieving 35cm between-row spacing) and hand-thinning the result at 8 days to 25cm spacing with one plant per hill. According to Lorraine, this work has given farmers in the four target villages the tools to sustainably increase their yields so that they can reduce dependence on imported rice. The successful adaptations also have the potential to progress the livelihoods of rice growers living in similar ecological environments throughout West Africa. (See Lorraine's International Agriculture and Rural Development MPS project document for details. You can also follow her progress over the duration of the project on her blog). [June 20, 2014] Peace Corps Senegal Volunteer Dana Roth organized a System of Rice Intensification (SRI) training at the Thilambol Master Farm in northern Senegal on June 16, 2014. Twenty four rice farmers from the region attended. The Senegalese government is providing seed, fertilizer, and tractors to prepare the new fields and irrigation trenches along with water pumps. Peace Corps will assist with the SRI training. For more info, see the Peace Corps Senegal article, which also links to some of the training documents. 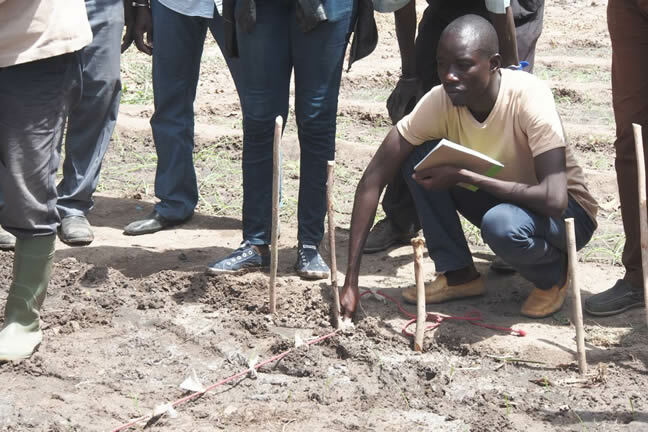 [May 2014] Peace Corps Senegal, funded by the Feed the Future Initiative, will be undertaking a System of Rice Intensification (SRI) Training Circuit May 7-15 in nine different sites in Northern and Southern Senegal. The goal is to train nearly 200 farmers in the SRI method, to have these farmers implement SRI this year, and further extend the method in subsequent years. The project will also include collection of data and subsequent reporting on different rice production methods, adoption of SRI, and yield comparison data of SRI versus traditional methods. Peace Corps Senegal volunteers and their counterparts hope to better understand rice production and to further extend SRI in Senegal in order to improve rice yields, thereby helping Senegal reach its goal of self-sufficiency in rice production. [January 1, 2014] The project Improving and Scaling up the System of Rice Intensification in West Africa (SRI-WAAPP) formally begun during January 2014. This is the first phase of a regional World Bank-financed project to increase rice productivity throughout a 13-country Economic Community of West African States (ECOWAS) area. The three year project, which includes Senegal, is part of the larger West Africa Agricultural Productivity Program (WAAPP), which is funded by the World Bank. SRI-Rice is the technical lead partner on the project, working in close collaboration with the coordinating institution, CNS-Riz, in Mali. Check the project's Senegal page in the coming months for updates. 2017. Une nouvelle technique de riziculture double les rendements à Nioro (ANCAR). Agence de Presse Sénégalasie, November 18. Sy, Souleymane Diam. 2017. Riziculture pluviale : La méthode Sri donne des résultats satisfaisants dans le bassin arachidier. West Africa Agricultural Productivity Program (WAAPP) website November. 2017. Toubacouta: Le SRI améliore les rendements en riz à Coular Socé. Agence de Presse Sénégalasie, November 17. 2017. Senegal adopts Climate Smart Agriculture to mitigate effects of climate change. West Africa Agricultural Productivity Program (WAAPP) website. November 9. Ka, Seynabou. 2017. Une agro-économiste salue la dimension régionale de la mise en œuvre du WAAPP, Agnece de Presses senegalaise (APS), October 29. 2017. La 10ème mission du WAAPP et de la BM visite des rizières de Fatick et Kaolack. Sinesaloum website. 2016. Mise à l’échelle du Sri – Le Prodam en visite dans les périmètres agricoles de Diowol. La Vie Senegalaise, August 17. Styger, Erika and Jenkins, Devon. 2016. Senegal and The Gambia Trip Report 07-17 December, 2015. 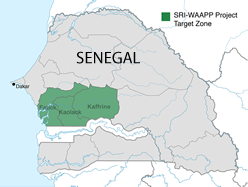 SRI-WAAP Senegal website. January. 2015. Rapport Annuel D'Avancement Du Projet N°26/DGE - SRI WAAPP 3 - FNRAA. SRI-WAAPP Senegal page. December. 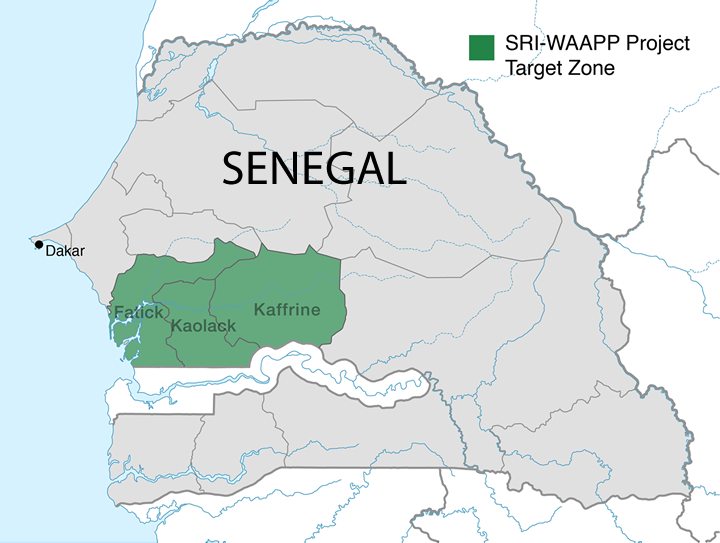 [The annual report for the SRI-WAAPP project activities in Senegal, covering the Kaffrine, Kaolack, and Fatick target zones]. 2015. Senegal launches major SRI initiative to train up to 5,000 farmers in the western Peanut Basin. SRI-WAAPP Senegal website. December 12. Maurice. 2015. Terroirs villageois à matam : 18 unités pastorales se renforcent en infrastructures. Le Soleil, September 5. SRI-WAAPP. 2015. 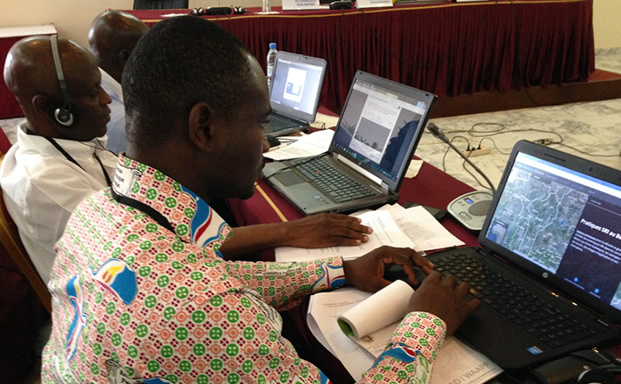 Summary Report: Regional training workshop on ARC/GIS and mobile data collection using 'Survey 123' for the SRI-WAAPP project - Dakar, 3-6 August, 2015. SRI West Africa website. 2015. L'ANCAR mise sur la riziculture intensive dans le Sine Saloum. Kaolackois.com [article discusses ANCAR's support for SRI training in West Africa]. Jenkins, Devon. 2015. Senegal Trip Report 26 February - 09 March 2015. SRI-WAAPP Senegal page. 2014. Adventures of MaryCad. MaryCad blog. Postings from 201-2013 about her SRI (and other) activities in Senegal as a Peace Corps Volunteer. Perricone-Dazzo, Lorraine, Famara Massaly, Youssoupha Boye, and Arfang Sadio. 2013. System of Rice Intensification training series report - July 2013: Peace Corps Senegal, Fatick and Kaffrine Regions - Senegal, West Africa. System of Rice Intensification website. July. 2013. Le système de riziculture intensive. IED Afrique website. AGRIDAPE April newsletter. [pg 13 of the newsletter has an article about Senegal]. Timothy J. Krupnik, Carol Shennan, William Settle, Matty Demont, Alassane B. Ndiaye, Jonne Rodenburg. 2012. Améliorer la production du riz irrigué dans la Vallée du Fleuve Sénégal à travers l’innovation et l’apprentissage par l’expérience. FAO research report. McClintock, Nathan C. 2006. Sustainable in Senegal: Profiles in Senegalese regenerative agriculture - Diabou Balde, rice farmer, Manthiankaning, Kolda region. 2006. The New Farm ( Rodale Institute), March 9. http://www.newfarm.org/international/senegal/0306/index.shtml. Stoermer, Danielle. 2013. Improving Food Security and Facilitating Farmer Adoption of Improved Technologies: An Evaluation of Peace Corps Senegal's Master Farmer Program. Master of Professional Studies project paper, Cornell University. [189p.]. Krupnik, Timothy. 2011. Integrated agronomic and socioeconomic assessment of a water-saving rice crop management system in the Sahel. Doctor of Philosophy, University of California Santa Cruz. Krupnik, Timothy J., Carol Shennan, William H. Settle, Alassane Bouna Ndiaye, Makhfousse Sarr, Matty Demont and Jonne Rodenburg. 2010. Adaptive On-farm Evaluation of Resource Conserving Rice Cultivation Practices in the Middle Senegal River Valley. Paper presented at the Tropentag conference, World Food System - A Contribution from Europe, September 14 - 16, 2010 in Zurich, Switzerland. 2012 (August 23). The First West Africa SRI Workshop, Ouagadougou, 8/26-27/12: Ernest Asiedu (Senegal). 5:00 min. Produced by SRI-Rice. sricornell channel, YouTube. PowerPoint by Madiama Cisse (ISRA), Baye Salif Diack (SAED) and Abdoulaye Sy (ANCAR) presented at the West Africa Regional SRI Workshop, Ouagadougou, Burkina Faso, July 26-27, 2012. 10 slides. Page 2 of Tim Krupnik's 2007 interim report contains photos of his SRI trials in Senegal. The photos in the SRI-Rice Senegal collection, which is embedded in the summary section at the top of the page, were provided by Tim Krupnik and Lorraine Perricone-Dazzo. If you do not have Flash installed, click here to see individual photos which are made available on Picasaweb.